today is malcolm x's birthday. born malcolm little, the adult malcolm changed his last name to "x" in order to shed the slave name given to him at birth. have you ever wondered where malcolm or our country might be now had those crazed assassins not riddled his body with bullets that cold february night in 1965? 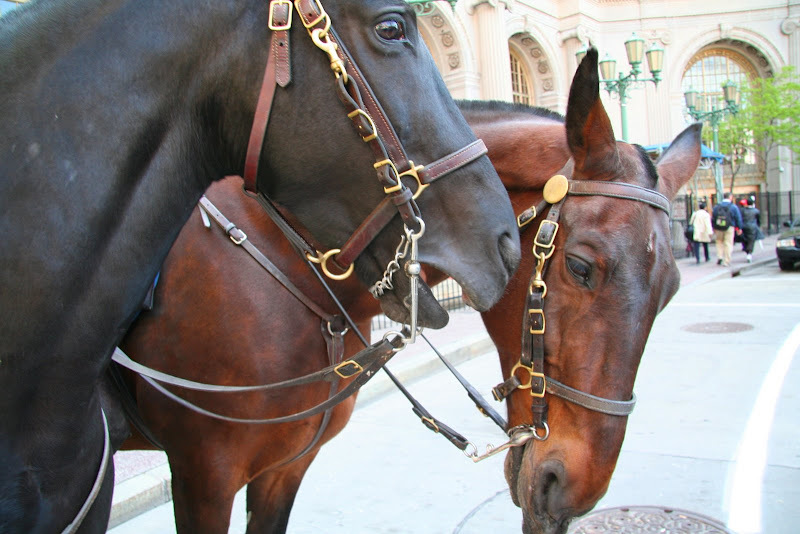 notes on photos: last week I met rascal and cruz, two of the six horses in cleveland's stable of police horses. 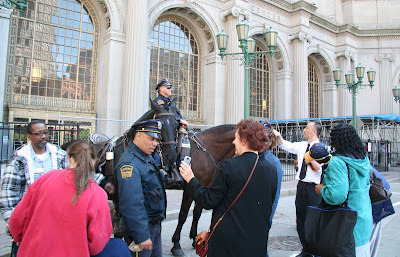 I also had the good fortune to talk to officer sikora and learn a bit about cleveland's mounted police. I remember a few years ago, then mayor campbell put the horses out to pasture. I asked officer sikora about that; according to the officer, the horses were out of work for 28 months. during that time there was a lot of private and public activity to reinstate the horses. long story short, the horses are back! if you are interested in reading about the long and sometimes turbulent history of the cleveland mounted police go here. the two horses in these photos are both tennessee walking horses, rascal (brown) is 20 years old and cruz is 9. there are three officers who ride horses, I met two of the officers. I learned that prior to joining the mounted division when he was 51 (he is now 62) officer sikora had no experience with horses. the city taught him how to ride. The first picture is magnificent!And what can I say about that song?Amazing! I love, love, love these two horses, kimy. I want them! Do you think they'd mind sleeping in a small courtyard ? (I would let them run wild every morning near the water.) Please? Please? I love the idea of cops on horseback. NYC has some too, I think -- though I'm not 100 percent sure about that. Seems like I've seen them in Central Park, maybe? kimy, i am especially proud of this post...usually people run.............away...........at the mention of Malcolm X. even now, you are a classic brave. The Kevin Baker books sound fascinating. I've requested Paradise alley from the library. I did not know today was Malcom X's birthday. Thank you for the reminder. And oh, no, a trilogy to add to my "to read" pile? Have you seen how tall it is getting lately? Obviously you haven't! Interesting about Malcolm X. While we're very aware of his campaign I always thought him too millitant to have achieved his objective. Interesting that as a young man he was sensitive and perhaps poverty, oppression and youthful exhuberance led to him being a more aggressive campaigner for equal rights. Those are absolutely magnificent animals. Powerful symbols to go with Malcom X day. The Rodin keeps calling me back. Fantastic. all your recent posts are truly lovely.